Table-tops offer lots of advantages for exercising teams and it’s easy to see why they are so popular for developing risk, continuity, security, safety, emergency, cyber and crisis capabilities. They are relatively straightforward to run, not too expensive and get immediate engagement and feedback in what is a very safe environment. Our five different ideas are taken from a mix of personal experiences and feedback from our training programme on exercise development. We are often asked how to get the best out of a table-top exercise as many organisations seek to avoid simulation or live exercises. BUT there is a limit to what table-tops can achieve and we always stress that they can only form part of an effective learning and development and testing model. Having got the health warning out of the way, it is fair to say that we support the benefits of table-tops and have developed some great techniques to get the best out of them. So if you are planning to run some, why not consider going the extra mile; after all, the humble table-top is an essential part of an effective learning and development programme for any response management system. How many of us actually use the event to promote the benefits and status of our response arrangements, be they Business Continuity, security, cyber etc.? And I don’t mean promote during the table-top session, please do not do this. What we can improve is the level of engagement and communication throughout the planning, delivery and feedback stages. Running the event is itself an opportunity to communicate to a wider audience the benefits of crisis and continuity planning and capability and raise awareness and engagement across the organisation. The environment of a table-top exercise is as far from the reality of an actual event as it is possible to go and this is one of its major weaknesses. But by taking steps to overcome this we can at least minimise this downside; any investment we make in ensuring reality will pay dividends. First steps are to ensure that everything is accurate, from the background setting for the scenario to the threat/risk and initiating events. Lots of research to start with but then it grows exponentially in terms of the preparation work to be done. As the response gathers pace the engagement with more and more people and organisations has to be accurately mapped out and each point of engagement analysed for the potential response. Get this wrong and you are in danger of building expectations that lay the foundations for failure in a real event. Getting the factual content right is difficult but reality is much, much more so; never forget the emotional aspects, the human factors, the feel of communications and the stresses of responding. All of these issues need to be taken into account during the scenario development. Response plans and arrangements are not primarily about individuals, although individual roles and competencies are important: they are essentially about teams forming and working together. So how does your table-top help to build teams? Consider the principles of team building and use these during the phasing of the session to encourage participation and try to avoid exercises that are purely task or knowledge focused. 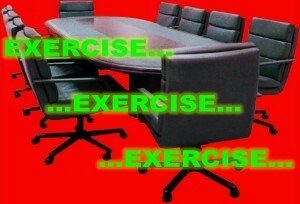 Take two minutes to recall your last couple of table-top exercises; how far back can you remember? If you are regularly involved in running them then it’s relatively easy to recall the details but think about how it feels from the perspective of the participants. They sit in on the session and the second they leave (and often during) it’s back to the avalanche of today’s problems and emails. Within a couple of hours the table-top is perhaps not forgotten, but it is starting to fade and a couple of weeks later? Well I will let you judge. So when planning the session think about the take-away: what is going to get the engagement you need and stimulate the grey cells to remember the key learning points. What is it that will cause your participants to review the key points and lessons learned? 5. Fear and Fun – How far will you go? Essential for any exercise; misjudge this and it can go horribly wrong, but there are rewards for getting it right. Let’s start with fun: people remember what they enjoy, particularly when they participate in groups. It generates post exercise discussions and the sharing of stories with others around the coffee point. It helps with future exercises; people will look forward to attending and they will engage more freely and openly in the sessions. As for fear, this is perhaps more contentious – and please do not think I mean that you set out to terrify people. Far from it; you do not want individuals scared to face the scenario or similar situations. After all, the real event may happen tomorrow. What I do like to see is that point of awareness that worries people - the potential exposure, the fear of failing to control situations and reality of what it could mean. Alfred Hitchcock found fame and fortune in films that made the scary seem real and audiences lapped it up! We hope you will be able to use these ideas to elevate your table-tops to be truly challenging and engaging learning events. By making the scenario real, presenting it in an interesting way and using the exercise programme to reinforce the messages of preparedness and response you can achieve “fear and fun” – but please, think more towards Hitchcock and not Government health adverts when doing this. Our next Corpress Exercise Design & Development course will run on September 29th 2016 in London. If you liked the ideas in this blog, why not find out more by clicking here.